Great art should provoke an emotion and leave a lasting impression. Many cities have had the chance to provide the masses with this opportunity. We are very excited that Vancouver has three new galleries that are either now open or opening soon for all of us art enthusiasts to enjoy. Nestled in a wooded area at the base of Blackcomb Mountain near Whistler Village is the newly opened Audain Art Museum designed by architect John Patkau. The 56,000 square foot gallery features a collection of First Nations art over the last 200 years. Works of Emily Carr, E.J. Hughes, Stan Douglas, Rodney Graham, Jeff Wall and Ian Wallace are permanently represented there. The building (which cost $30 million to build) and the art collection was donated by Polygon Homes’ chairman, Michael Audain and his wife Yoshiko Karasawa. The angular, dark metal-clad structure was designed to blend into the forest that surrounds it with only one tree removed on the site to build it. This museum is definitely a stop on your next trip to Whistler. Another notable gallery designed by Patkau Architects is The Polygon Gallery located in North Vancouver. The new public art gallery is a part of the revitalization effort to turn the waterfront on the North Shore into a new cultural hub. Upon completion in 2017, the 19,000 square foot space will feature contemporary art from local Vancouver artists. The building will have space for galleries, events and community engagement and is accessible to all with affordable admission fees – $5 for adults, $3 for seniors and free of charge for youth and children. 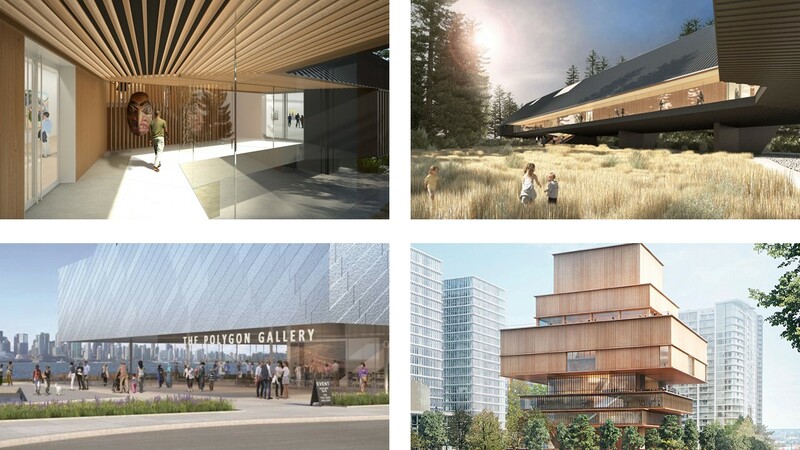 Located at West Georgia and Cambie Streets in downtown Vancouver will be the new home of the Vancouver Art Gallery. The winning design for the new building that features a wood exterior is by Swiss architects Herzog & de Meuron and will have 85,000 square feet of exhibition space and includes a new education centre with a large 350-seat auditorium, library services and archives. The project cost is estimated at $350 million and will be underway once all the funds are raised. It isn’t everyday that we see an addition to Vancouver’s skyline that doesn’t include a typical rectilinear shaped tower with a glass façade. For all of us design enthusiasts, we always hope that one day a unique architectural masterpiece will rise up in Vancouver and help put us on the map as a city with an appreciation for design. To our delight we are slowly seeing some progress with some exciting new towers going up in the next few years in the downtown area. Here are the three that we are keeping an eye out for! Already under construction, Vancouver House is a game changer. Designed by the Danish design giants Bjarke Ingels Group (BIG) and Canadian firm DIALOG, Vancouver House is the epitome of world-class architecture in Vancouver. With a triangular base that twists and expands this unique tower appears to defy gravity. Once it is completed in 2018, Vancouver House will energize the Beach Avenue and Howe Street location it sits on that has been a tight and dark wedge of space darkened by a bridge off-ramp for years. Also keep a lookout for the market-style area under the nearby Granville Street Bridge that Westbank will be implementing with a budget of 4 million dollars! Providing a distinctive new entrance into Vancouver from Stanley Park and the North Shore is the proposed jenga-like tower at 1500 West Georgia Street. Designed by German architect Ole Scheeren, this unique tower will rise up 436 feet and feature rectangular blocks that protrude out of the upper levels connecting the indoor and outdoor environment. As Bosa Properties’ most architecturally ambitious project, the building will also have green features such as solar panels and will aim for LEED Platinum certification. For his first tall building in North America, Japanese architect Kengo Kuma has designed a residential tower in Vancouver. With a curved silhouette created by two concave sides, the 43-storey condominium will be in the West End and is located near the entrance to Stanley Park. Through materiality, the design aims to convey a sense of connectivity and transparency using anodized aluminum and glass. Referencing traditional Japanese gardens, the building will be surrounded by trees and moss and reinforces the design that celebrates the presence of nature in Vancouver. Everyone loves a good vacation, but what if we just don’t have the time to escape far away? Luckily, there are many exquisite places to visit right here in beautiful British Columbia – a staycation if you will. Staying relatively close to home doesn’t mean that you can’t have it all. These two dream-worthy staycation destinations are sure to be on your bucket-list for a weekend of rest and relaxation! Engulfed in a lush spruce and cedar forest on the edge of Lost Lake in Whistler is the Scandinave Spa. Boasted as an authentic Scandinavian Spa, this day spa is sure to invigorate and cleanse your body and mind. While alternating between saunas, steam baths, hot baths and cold plunges in hydrotherapy, you can take in the incredible mountain vistas. At 20,000 square feet, the Scandinave Spa is filled with relaxation rooms, sauna and steam rooms, massage rooms and even a café. If you also want to squeeze in a tan, the various terraces stacked up the hillside offer plenty of deck chairs and hammocks for you to relax in. Another feature we love about Scandinave Spa is their Eco Spa which emphasizes green and sustainable alternatives. A design feature is their green roof which ensures that there is efficient heating, cooling and insulation year-round. This is definitely a place you can easily spend a day in while you are visiting Whistler! As the name suggests, the Sparkling Hill Resort in Vernon, BC is truly sparking with over 3.5 million Swarovski crystal elements. This $122-million resort was funded by Gernot Langes-Swarvoski and is the brainchild of Austrian, Hans-Peter Mayr. Sparkling Hill is the perfect blend of North American pampering with a therapeutic European approach. Situated on Mount Royce, the resort has sweeping views of the Okanagan Lake and Monashee Mountains which can be enjoyed from each of the 152 suites. Complete with custom-designed Kohler soaker tubs, crisp white linens and natural wood finishes, each room is warm and features streamlined European inspired design. The resort’s 40,000 square foot KurSpa is where you will be spending your time. This European-inspired spa, clinic and wellness center has seven unique aromatherapy, steam and sauna rooms. Each steam and sauna room are a different experience and a true work of art. To top it all off, you can pick your choice of nozzles and showerheads, colors and scents in the Experience Showers. No detail was missed here as the serenity pool also has underwater music! If this resort doesn’t already sound like heaven, each stay also includes a full, hot breakfast in their PeakFine restaurant. Their menu is sure to delight especially paired with a local Okanagan wine. If casual is more your style, the Barrique & Java is a café and pastry shop by day and wine bar by night. What is there not to love about this place? If you still have money to burn, make a stop at the Swarovski Gift Shop. 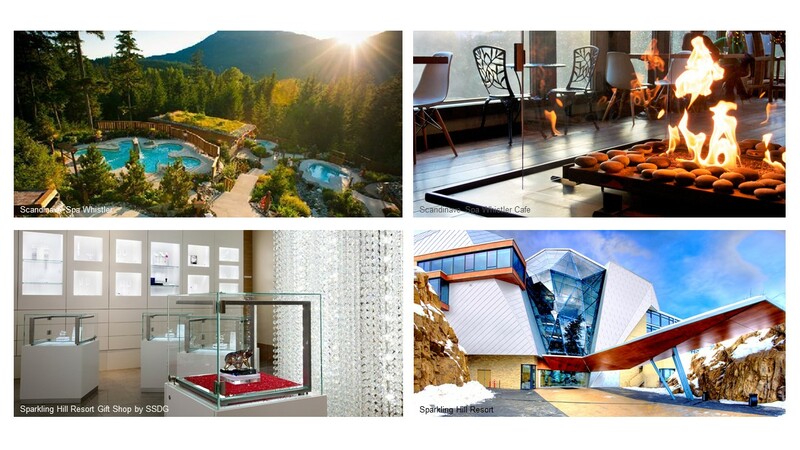 This very opulent and award winning resort was designed by the talented SSDG Interiors Inc.
Where do you want to go for your next BC Staycation? Let us know in the comments.